Know when to gorge and when to snack. More importantly, know the foods that do your body a world of good. Here's how you can follow a diet plan that's simple and completely balanced. Your body responds to not eating for hours by slowing down its metabolic rate. By having breakfast you wake up your metabolism and get your engine humming, burning those calories to lose weight. 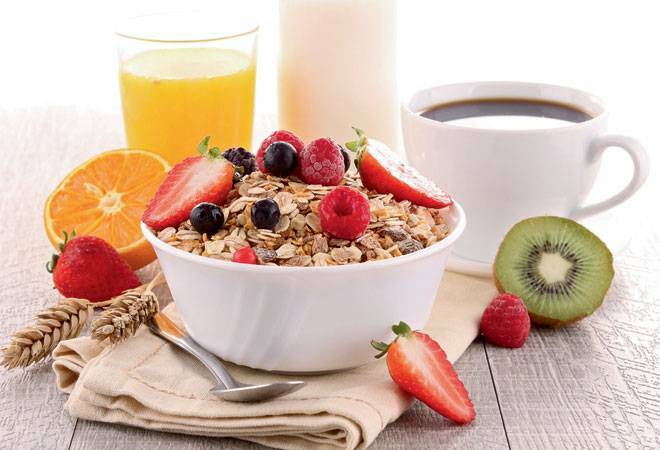 Research suggests that people who eat breakfast are less likely to overeat later in the day. Skipping breakfast can increase sugar cravings as well. Your breakfast should be a combination of proteins and complex carbohydrates. Rely on foods rich in Omega-3 fatty acids such as flaxseeds and walnuts and those that are high in magnesium. This includes bananas, lentils and figs to fuel up your brain cells. Omega-3 helps in better object recognition memory, spatial and localised memory and adverse response retention. Foods rich in choline such as eggs, cauliflower and soybean may also support the brain during aging. It's very easy to drink a lot of calories without realising it. Cutting liquid calories can be more effective for weight loss than cutting the same number of calories from your solid food intake. Calories from solid foods don't disrupt functioning of appetite-regulating hormones. Your brain relies on glucose for energy. It's important to evenly distribute your carbohydrates through the day. To get a steady supply of glucose, include complex carbohydrates such as dalia, lentils, beans, oatmeal and amaranth. Don't fall for empty promises while looking for a quick health fix. High protein diets claim that you'll lose pounds and reduce your risk of heart disease but the truth is that fat comes from too many calories, not too many carbohydrates. People in starved states experience problems with brain function. A high-protein diet also overworks the kidneys. Without some dietary fat, you can become deficient in essential fatty acids and have trouble absorbing vitamins that are fat-soluble. Also, certain kinds of fat - unsaturated ones - help protect your heart, reduce type 2 diabetes risks. Lowand no-fat foods aren't always lower in calories. These claim to improve gut health, cure stomach problems and aid weight loss but be wary of its sideeffects. Gluten may help fight heart disease by lowering levels of triglycerides and help reduce high blood pressure. As for weight loss, a gluten-free diet may backfire. Many foods without gluten are higher in calories, fat and sugar than the wheat-based versions. Laziness and inactivity kill just as many people as smoking does. Long hours of sitting can shorten your life span. Don't be tied down to your desk, stand and stretch every 20-25 minutes. Get at least 60 minutes of physical activity per day. You don't have to rely on your gym membership for that. Walk the dog, dance, work in the garden or ride your bike. Fibre, found in whole grain wheat, barley, oats, as well as in fruits, vegetables and beans, helps keep things moving easily through the digestive tract. Remember that grain fibre has different nutritional benefits than fruits and vegetables, so you need both. Fibre is also filling, providing volume with few calories because our bodies don't have the enzymes to break it down. After dinner, teach yourself to think of the kitchen as being closed for the night, and brush your teeth - you'll want to eat less with a newly cleaned mouth. If a craving hits, wait for 10 minutes. If you're still truly hungry, reach for a cup of milk, yogurt or a piece of fruit. Sit down, formalise and eat from a plate (even if it's a snack). You tend to eat more recklessly, when you eat in the kitchen, out of the fridge, or in front of the TV. Call a friend, take a walk or read a book but don't binge out of stress. Don't ruin your favourite foods with guilt. Deprivation and shame are powerful emotional triggers for overeating. Remind yourself that all foods can fit into a healthy diet when you balance eating for enjoyment with eating for nourishment. It's absolutely okay to give in to the occasional craving when you're primarily eating home-cooked food and exercising.